In other news, wow. What a day. 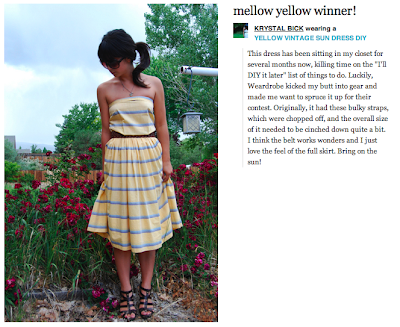 Woke up a smidge early and realized that I had won the Weardrobe contest "Mellow Yellow" only to yell out "I won!" to the last person on earth that would ever know what I was talking about--my boyfriend in an early morning haze of sleep. (Sorry about that, Ian). Of course, a big thank you is in order to the Weardrobe team for picking yours truly and specifically to Weardrobe's wonderful Jessica Schroeder of What I Wore for being so supportive and enthusiastic about fashion and fashion blogging. She's got a good sense about blogging, incredible style and some overall good life vibes. Seriously, go check out her blog. You'll view your closet a little differently. And as if that wasn't enough, I was notified that I was featured on Weardrobe's tumblr blog. Seriously, guys. I'm sure my boss had his fair share of concerns after seeing my blush activity today. Thank you, again! Now, as for the Anthropologie gift card...let the online shopping begin! Then maybe some sleep. Night ya'll. Congratulations! I loved your look when I saw it on Weardrobe! I love the softness of that dress and the sandals are perfect with it. Why thank you! It's probably the best $7 dress I've ever bought. Super comfy! Congrats! I like your style, I'm putting your blog on my GoogleReader <3 Check mine out if you would like...and keep up the great style!